Last modified: April 8, 2019 at 7:45 am by Charles C.
Regularly scheduled cleaning of the scanner is recommended to ensure that the device feeds documents smoothly and delivers good quality images. Over time, the feed rollers in the scanner will accumulate dirt from the documents being scanned, necessitating that they be cleaned regularly, see below. When dirty, the feed rollers have a greater tendency to slip, misfeed, or jam, resulting in poor quality images. To clean the feed rollers, alcohol or water-based solution should be used. “Card Reader Cleaning Cards, CR80,” notebook screen cleaning wipes, or alcohol prep wipes/swabs are recommended, as long as they are water or alcohol-based. Note: Do NOT use an ammonia-based cleaner. There are a series of DIP switches on the rear of the scanner. By default, all F1500 scanners are shipped with their service DIP switches set to the OFF (UP) position. DIP switch #3 will put the rollers into a repetitive back and forth spin mode that is useful for cleaning the rollers. Lift the cover to expose the feed rollers. Carefully modify DIP switch #3, moving it to the ON position (to the DOWN position). Power on the scanner. The rollers should begin moving back and forth. Using a cleaning wipe or alcohol prep, hold it against the roller, cleaning them as they spin. Discard the prep/wipe when done (do not use it to clean another component). Carefully restore DIP switch #3 to its default setting of OFF (UP). If irregular stripe patterns or artifacts appear in the scanned images, the CIS (CMOS image sensor) may be dirty. In this case, the CIS should be cleaned to ensure the scanned images are of good quality. The CIS can be accessed by opening the scanner. To clean the CIS, alcohol and/or water-based solution should be used. “Card Reader Cleaning Cards, CR80,” notebook screen cleaning wipes, or alcohol prep wipes/swabs are recommended, as long as they are water or alcohol-based. Using a cleaning wipe or alcohol prep, clean the CIS (scan head) bars then discard the wipe when done. There are two CIS bars on the F1500. 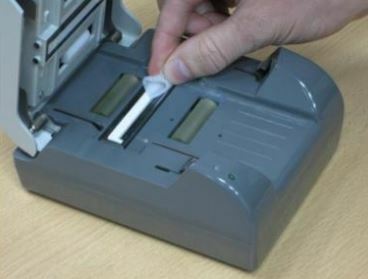 Over time, the magnetic stripe reader will require cleaning to remove buildup and to ensure proper operation and accurate reads of magnetic stripes. 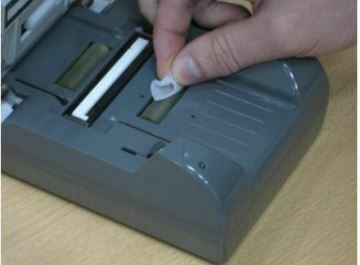 Lift the cover to expose the magnetic stripe reader. 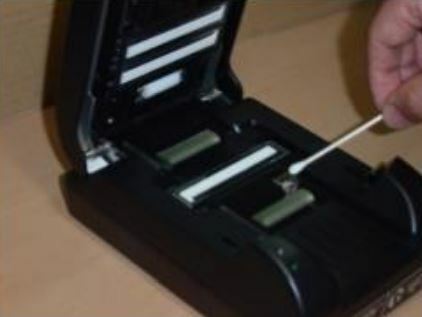 Using a cleaning wipe or alcohol prep, clean the magnetic stripe reader. Discard the wipe when done. The document sensors are utilized to detect the presence of a document in the feed path. They are visible when the scanner is opened as small holes before and after the first roller on both the top and bottom surfaces. There are two pairs of sensors, the first pair (top/bottom) is before the first feed roller, and the second pair (top/bottom) is immediately after the first feed roller. Documents are detected by breaking the light path between the two sensors. Dust or dirt may collect in these holes over time resulting in the scanner not properly detecting when a document is present. To avoid issues, these sensors should be cleaned to ensure the sensor path is free of dirt. Lift the cover to expose the document sensors. 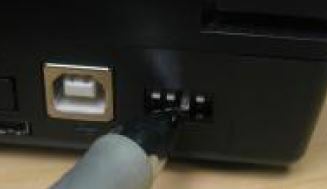 Using compressed air or an air gun, blow air into the document sensor holes to remove any dust or dirt buildup. When using a compressed air can, ensure that it remains upright to avoid getting any residue on the CIS.